With its touchscreen input, compact size, internal Nintendo-style synth, and wireless Internet connection, the Nintendo DS has a lot of appeal for music use. The challenge is how to hook it up to a computer. TheRain has a hardware hack called DSMIDI: with a little soldering and hacking, you can connect the DS to a standard MIDI cable via a cartridge. X/Y “Kaoss Pad” controller: The must-have for the DS, you can turn the touchscreen into an X/Y controller. This to me is especially exciting, as it’s a natural for the DS hardware and the units are small enough that they could be propped on a keyboard, etc. Keyboard controller: A MIDI keyboard controller sends notes, pitch bend, and MIDI controller adjustments via an on-screen keyboard. Sure, you might not want to use this to replace a hardware keyboard, but it could be great for programming and for controlling other things (triggering clips, running visuals, etc.). 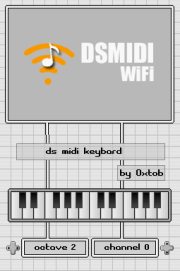 DS Synth: The internal sound generator provides vintage Game Boy-like sounds. Now, I know purists prefer the original 8-bit Game Boy, but I kind of like the idea of bringing chiptune music into the 21st Century … especially if means I can rationalize buying a DS Lite. Erm, I mean … uh … going wireless. The software is the creation of TheRain and Tobias Weyand, the creator of NitroTracker. The good news for you programmers out there is that they’ve completed open-sourced the code, so you could use this as the basis of your own wireless Nintendo DS creations.